Climate change impact assessments usually focus on changes to precipitation because most global food production is from rainfed cropping systems; however, other aspects of climate change may affect crop growth and potential yields. A recent (2011) study by the University of California, Santa Barbara (UCSB) Climate Hazards Group, determined that climate change may be affecting Mozambique's primary food crop in a usually overlooked, but potentially significant way (Harrison and others, 2011). The study focused on the direct relation between maize crop development and growing season temperature. It determined that warming during the past three decades in Mozambique may be causing more frequent crop stress and yield reductions in that country's maize crop, independent of any changes occurring in rainfall. This report summarizes the findings and conclusions of that study. 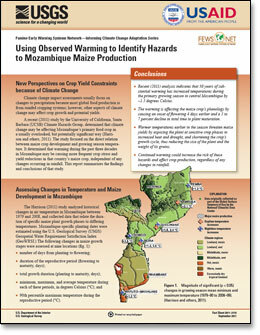 Funk, C., Harrison, L., and Eilerts, G., 2011, Using observed warming to identify hazards to Mozambique maize production: U.S. Geological Survey Fact Sheet 2011-3110, 4 p.